Thank you for your interest in donating to the Bone Marrow Transplantation Program. Your donations will help funding the operational costs of the Bone Marrow Transplantation Procedures. Thanks to all who generously supported to sponsor a specialist medical team of 16 from NCI Maharagama for their training at St Vincent's Hospital, Sydney in February - June 2015. Having performed the first Autologous Transplant (using Patient's own Stem Cells) at NCI under the guidance of St Vincent's BMT team in October-December 2016, over 50 patients have received a second life to date (Feb 2019). Now the Specialist team from Haematology Department, St. Vincent's Hospital is ready to travel to Sri Lanka to implement Stage II - Allogeneic Transplant (using sibling or unrelated donor stem cells). BMT is an expensive medical procedure even by international standards and cannot be solely supported by the present free medical and healthcare system prevalent in Sri Lanka. Therefore, donor funding is integral to the success of the program and we welcome your generous donations. 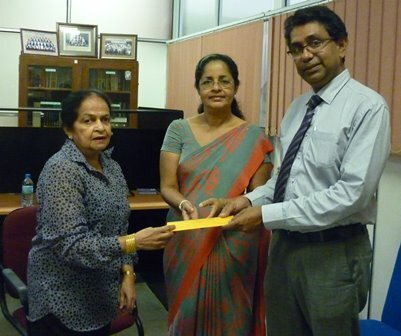 Mrs. Lena Wijeratne on behalf of the Chairman of Maliban Biscuit Manufactories (Private) Limited, Sri Lanka, Mr. A G R Samaraweera, handing over the donation to the National Cancer Institute, Maharagama for the BMT Training Fund on 24th December 2014. SLT (Sri Lanka Telecom) provides support to bone marrow transplant unit at Cancer Hospital Maharagama.